Interior lighting on cars has not changed much since the 1930’s. Inefficient bulbs create more heat than light, draw a lot of power, and make the car interior look dingy and anything that requires your attention is hard work and tiring. 4Sight light modules change all of that. The LED’s they use were originally developed to mimic natural sunlight in SAD treatment lamps. Using specially developed bulb-replacement adaptors, it is easy to remove a standard bulb, fit the appropriate 4Sight adaptor, and then fit the largest 4Sight synthetic sunlight LED unit your interior lamp will accommodate. The result? Instead of a feeble yellow glow, your interior light will now give out many times as much light. The light will look the same as sunshine, and your car interior will look far better. Reading, or any detailed job, becomes a pleasure and less tiring, and your lights can stay on for hours without flattening the car battery. Also, the lights never get hot or discolour the light lens. Also, with the launch of the 4Sight MiniLights, you can add extra lights to create a beautifully illuminated, shadowless area. They are small and neat and easy to fit. 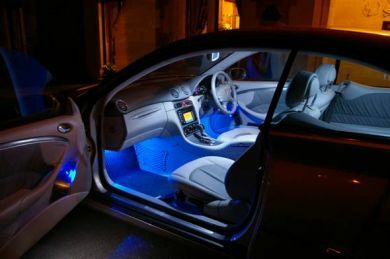 Just as light coming from several points improves the appearance of a room, you can transform the lighting in your car, in the cabin, in the engine bay, or in the luggage area or boot. To buy any of our interior lighting products, click here.